About Me: Flowers have been a constant inspiration for my art work and I think that watercolour is an ideal medium to portray both their colour and delicacy. I live and work in the north of England so the countryside around me is another source of inspiration as well as the warmer climates of southern Europe. » These cards are taken from my own watercolour paintings. 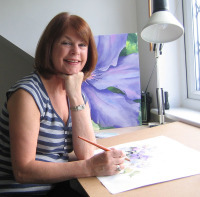 I particularly enjoy painting flowers but also love landscapes of my home in England and holidays in Europe. I hope you find something that you would like to send. extraordinarily beautiful artwork ... how talented you are!!!!! Lovely cards, lovely store! You are very talented. Hi Rachel! Your Pink Orchid Spray card caught my eye this morning and brought me to your store. What stunningly beautiful watercolors!!! You're a very talented lady and I thoroughly enjoyed my visit! Rachel, your watercolours make me sigh ... with envy! All of my adult life, I have been trying to paint like this, and your cards are simply beautiful. I wish you every success, although I'm sure you don't need it, you must do really well with your designs. Beautiful paintings. Would love to see these as prints for walls. Rachel, It is great to get to know you via the Community Spotlight. Your paintings are lovely. Your dandelion card is so pretty. Congrats on being in the spotlight! Absolutely love your watercolor works! My favs are Love in a MIst and Cosmos...simply stunning! I enjoyed stopping by your store. Love your watercolours Rachel, especially the Cumbrian Farm and Staithes paintings, and they look great on your cards. Rachel, your store is a joy and inspiration. I love your art! Beautiful paintings! Love the look of watercolors, just haven't mastered it yet! Truly enchanting art and store! Beautiful watercolors.you have a great style,lovely cards. You have a lovely style. I really enjoy your paintings! I really love your paintings and wish you all the best! Awesome images from an awesome talent! Your watercolors are absolutely splendid. Love those Christmas berries! Love your cards. You are a great artist. I am sure you will have great sucess. Your cards are gorgeous! I envy your abilities in watercolor. That is one media I never mastered. I hate to admit this, but this is the first testimonial I've taken the time to submit. Keep them coming, I'm sure you will see much success! I love your work! Beautiful watercolours...my favourite medium! You should be very proud of your shop, it's an inspiration to me as I haven't painted in a while....the little bridesmaid is lovely. From one 'northern lass' to another! absolutely beautiful! Especially white peonies and anemones, also two of my favorite flowers! Rachel - Your watercolors are beyond words! You are a true talent! Your gallery would have to be one of the best on GCU. Your paintings are breathtakingly beautiful... exquisite even! If I could I would have each one. You are a true artist!